Reader Friday: What Color Is Your Aura? Everyone, Some people say, has an aura. And every aura radiates a different color. Take the following quiz, and tell us which color your aura reflects! And how would you guess your aura’s color affects your writing style, if at all? You are optimistic and intelligent, with a friendly, creative presence. A yellow aura signifies that you are full of life and energy, an inspiring and playful person. You may be on the brink of a new awakening, close to finding new meaning in your current life. My aura is yellow, according to my quiz results. I like the description, (I pasted the descrption for a yellow aura into the post’s text), but I’m not sure it’s true. I hope so, though. Supposedly I’m green–then again, when I look in the mirror, I can’t even see my aura–just that I need to shave. Love, sincerity, affection and generosity are perfect words to describe you. Your pink aura indicates that you’ve achieved a perfect balance between your spiritual and material existence. You love to be surrounded by friends and family. You love to love and to be loved, while you hate conflicts and arguments. You take care of your body and spread a positive and healing energy to those around you. The pink aura is very rare, so is the person who has it. Oh goodness, I WANT to be pink too! It sounds like I’d be in better shape as a Pink. But darn it, I Yam a Yellow Couch Potato. I don’t look like any of the animals. Yes, I had to pick the None of the Above Scottie dog sign. Get another coffee, Mr Grumpy. My aura is French Roast. It’s pretty funny that my aura results states I hate conflict and arguments, which is true, but that trait doesn’t mean I won’t speak up. I’m very assertive, in fact, yet I try to be mindful of my approach to get the result I want. What the aura description got right is my focus on family and friends, making them a priority in my life. I believe this affects my writing in the way I pursue emotional stories with a constant theme of family. I firmly believe blood does not define family. In all my travels, I’ve formed close relationships that I gain strength from, people I stay in touch with over the years. I like the idea that we can define our “tribe” as time goes on and bring new people into our inner circles, to love them unconditionally as if they were blood family. So the themes I write about, and delving deeply into the emotion of a scene, are ways this aura description feels right. 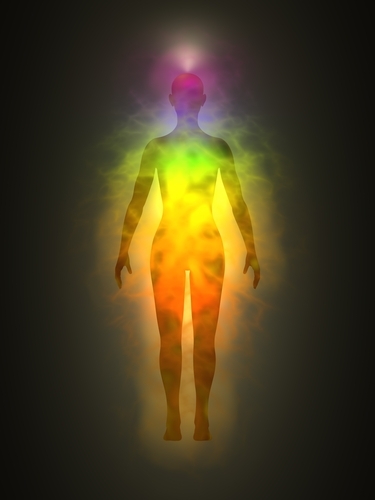 A red aura is one high in energy, which shows that you may have some unresolved anger or fear. However, it also shows that you have a lot of strength and passion, which will help you resolve any conflicts. This passion can be in relation to romance as well, as a red aura signifies that love is an important factor in your life. I hope this translates into writing passionate protagonists, interesting conflicts, and creative resolutions. I feel that my “real life” aura is also somewhere in the Red zone, Tru. We should form a club. You rock, George! Thanks for joining us today! My aura is blue. I’m so chill! I envy you your Blue aura , Laura, just like I envy Jordan her Pink one. Which means I must be in Truth a Lavender-aura Gal. Jeez, I just now noticed I misspelled “lavender” in a writing blog! I fixed it now. Being a bit of a slacker as self-editor must come with the Yellow Aura Package. Green: You are a compassionate person, full of healing and peacekeeping capabilities. Very close to nature, a green aura is a healthy one, full of growth and balance. You have a love for living things and seek to change the world for the better. I think Green is great, no matter what Kermit says. Thanks for joining in, BK!! What? No one else is white? Ten years ago I had my aura read in India. The reader said it was dull, that I needed more yellow and orange in my life. I bought a yellow and orange bedspread, I painted my house with tints of gold tones rather than grey tones, and I started wearing more yellow, orange and rust, which probably looks terrible against my skin tone but makes me feel lively. Yet after all these reforms and all these years, I still come in at WHITE? Is well balanced the same as dull? I give up. Now I’m depressed. Will that get me a better color? I chose the no dogs sign also. That’s part of the reason I think I was punished! I’m pink too. It may be rare, but not for writers it seems. Mine is yellow, too. Fun! Mine is pink, too. If it’s so rare, why are there so many of us? Thanks for the fun quiz. Mine is green – I would agree with loving being in nature. If I don’t go outside for a walk for two days in a row, no one including me wants to be around me. When I’m procrastinating with writing or have a block about a situation being outside will normally clear the way. Unfortunately, I haven’t figured out my Dragon dictate program or the little bluetooth that I can use to dictate to the Dragon App on my iPhone. Somehow I need technology to be more green? ?